It’s a strong full-frame mirrorless debut. As I've said (repeatedly) for the last few months, Sony has run circles around rivals with its A7 series full-frame mirrorless cameras, most recently the A7 III and A7R III. When Nikon and Canon finally released their own models (the EOS R and Z7/Z6), they showed that there is one advantage to being number two. Both companies were able to develop all-new mounts that maximize the potential of full-frame sensors, setting themselves up for a strong future. 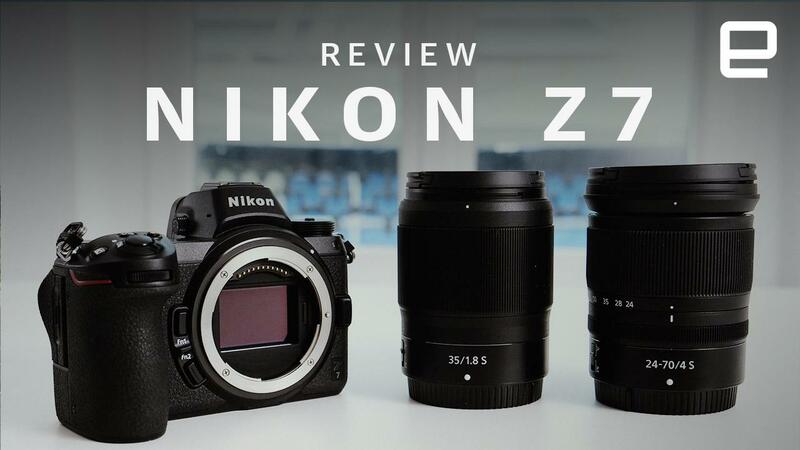 Be the first to review the Z 7? So, how does the Nikon perform in the real world? It's no Sony A7R III killer yet, and can't even match the capabilities of its DSLR sibling D850. However, Nikon did a lot of things right with the Z7 that its long-standing nemesis, Canon, did not. If you've already invested in Nikon DSLR lenses or are looking to get into a mirrorless camera for the first time and have the budget, the Z7 is a great choice. The Z7 is the second best handling mirrorless camera out there. The tough body is not only made for bad weather and abuse, but it has a big handle that's easy to grab and hold, even with a large telephoto lens mounted. I don't rate it quite as high as the EOS R, however, which has a superb body design. The Z7 has a logical ergonomic layout, with the dials for your right forefinger and thumb exactly where you'd expect them. I also appreciate the position of the power button on the right, letting me turn the camera on and off each time I shoot. It's got a real joystick that doubles as a function button, making it a lot easier to set the focus point than the EOS R's wonky touchscreen arrangement. Unfortunately, however, you can't use the touchscreen to set focus with your eye to the EVF, like you can on other cameras -- you can only use the joystick. There are no buttons on the left-hand side of the camera, but I prefer the controls to be on the right, frankly. Nikon did add two function buttons to the front of the camera, easily accessible between the grip and lens mount, much like you'll find on the D5 and D850. Unlike the EOS R, which has an all-new separate control ring, the Nikon Z7 lets you repurpose the focus ring on the new lenses for aperture and exposure compensation. I like that idea -- it's an electronic, not mechanical control that goes unused in autofocus mode, and if you disable AF, the ring switches to manual focus mode automatically. That's a pretty smart move as it means there's one less lens ring to mistakenly grab. I don't care for Nikon's menus, as the controls aren't laid out very logically, and you're forced to scroll through a long list of functions. Canon's EOS R, by contrast, breaks things into categories, which is helpful for both learning and using the system. To avoid diving into the menus on the Nikon Z7, you can use the "i" button, which lets you set up to 12 functions. The Z7 has a mount with a slightly smaller 55mm diameter flange distance than the Canon EOS R's 58mm mount, but a much closer flange distance (16mm compared to 20mm). Sony's FE mount, meanwhile, is about 46mm. What this means is that Nikon can, in theory, make fast lenses that are relatively compact, much as Canon did with the RF 50mm f/1.2 and the 28-70 f/2 lenses. So far, Nikon hasn't done that though, instead releasing three uninteresting lenses: the 24-70mm f/4 S, wide-angle 35mm f/1.8 S and standard 50mm f/1.8 prime. At least they're fairly cheap ($1,000, $850 and $600, respectively), but folks buying a $3,400 camera will probably be looking for better glass. I tested the Z7 with the 24-70mm and 35mm lenses, and they were decent, but nothing more. By contrast, I got to try the EOS R with a better zoom (the 24-105mm f/4) and a much better prime, the 50mm f/1.2 model, which blew me away. Still, better things are to come, and with the Z7, you're buying not just a camera but making a leap into an all-new system, too. Nikon will soon release the Nikkor 58mm Noct-Z with an insanely fast f/0.95 aperture. Sure, it's manual focus only and probably weighs a ton, but it will let Nikon flaunt the potential of that big mount. According to its roadmap, the company will release a variety of zooms and fast primes by 2020. At that point, it'll have 13 lenses in total -- by contrast, Sony currently has 29 lenses, not counting third-party models. Should that not do it for you, Nikon has 90 aces up its sleeve in the form of its F-mount lenses. With the $250 FTZ F-Mount adapter, you can use every one of them with varying degrees of compatibility. You get full autofocus with AF‑S, AF‑I and AF‑P lenses, but not with older AF or AF-D models that rely on an external motor. You won't lose a pixel of quality, however, as the adapter gives you exactly the same optical specs you'd get with the D5, D850 and other full-frame Nikon DSLRs. I tried several EF-S lenses out, including the 14-24mm f/2.8 and 28-70mm f/2.8 models. The performance seemed good to me, that is to say, they focused nearly as quickly, if not as quickly, as the native lenses. It's notable, however, that Canon offers not just one, but three adapters for its EF lenses, including a much cheaper $100 basic adapter and a very cool $400 model with a built-in neutral-density filter. The brilliant 3.69-million-dot electronic OLED viewfinder, with 100 percent coverage and a 60 fps refresh rate, is one of the sharpest and clearest I've ever tried -- but for one flaw. In single-frame shooting, it edges the EVFs on the Sony A7R III and Canon EOS R, even though the electronics are the same. That's because Nikon treated the EVF optics as it would any lens, using anti-reflective aspherical lenses and a fluorine coating on the eyepiece window. In continuous shooting mode, however, at 5.5 fps, the EVF often glitches out, not refreshing to show the next frame. That makes action shooting pretty tough, a theme that would continue throughout my testing. For regular shooting, however, I used the EVF for everything and loved it, often forgetting that the rear touchscreen even existed. Speaking of, the touchscreen is pretty great. It not only lets you touch to focus, like Sony's A7R III, but you can run the entire menu and i-control system from it. It's fast and responsive and switches seamlessly to the EVF when you lift it to your eye. Unfortunately, it only tilts up or down, so vloggers won't be able to flip it around to see themselves. Too bad, because it's a pretty strong camera for video -- more on that in a bit. The Z7 has in-body stabilization (IBS), which Nikon calls vibration reduction (VR). That gives you stabilization on any lens you're using, even older manual-focus models, making low-light shooting and video a lot easier. Having a large mount helps stabilization as it gives the sensor more room to move to counteract shake. I found that it works really well for both video and photos in low light, even handheld down to 1/10th of a second. It also gives Nikon bragging rights over Canon, as the EOS R does not have IBS. Unfortunately, it only has a single card slot, and it's an XQD model. While that gives you fast transfer speeds and shooting, you can't exactly pick those cards up at your local drugstore. Canon's EOS R also has only one slot, but at least it's SD UHS II, a more common and cheaper card format. The speed of the XQD card is also crippled by a tiny buffer, so burst shooting is limited to just 18 full-quality RAW files. By contrast, the D850 has a huge buffer, letting you write to the same XQD card nearly as fast as you can shoot, without stopping. These cameras are around the same price, remember. How's the battery life? Well, the new EN-EL15 battery, designed to be charged over USB, is limited to a mere 400 shots per charge by standard CIPA specs. However, I and other testers found it'll easily do more than that. I went out for an afternoon, took about 300 photos, and still had three-quarters of the battery left. If you really need to go all day, Nikon will offer a battery grip option sometime in the future. Nikon's D850, with its 3D phase detection, is often cited as the quickest and most accurate autofocus (AF) system on the market. The Z7, unfortunately, doesn't quite follow in its footsteps, despite having a similar sensor. It does have extremely wide AF coverage, with 493 points that cover 90 percent of the frame. Using single point, continuous autofocus (AF-C), tracking of still and slow-moving subjects is excellent -- I got a hit rate of at least 9 out of 10 shots in sharp focus. Tracking quick-moving subjects is a different story, however. Unlike the D850 or other mirrorless models like Sony's A7R III, the Z7 tends to lose focus on moving subjects and switch to the static background. This seems to happen for no good reason, and it never picks them up again. The same sort of thing happens with face tracking. It works fine if the subject doesn't move much, but often fails when it darts around, especially from afar. Note that the Z7 doesn't have eye-tracking autofocus, only face tracking. That means you might not get sharp autofocus on a subject's eyes when using a lens with a very shallow depth of field. As I learned early on when first testing the Z6 and Z7 in London, it helps if the subject tracking locks on solidly first. That's done by selecting the person or object manually using the joystick or rear touchscreen, which can slow down your shooting. After that, it will often track them well, but it can still sometimes switch to another subject or the background. The problem is exacerbated in low light. The Z7 has great low-light sensitivity, but the autofocus system tends to fall down below about -1 EV -- well below the -3 EV level of the APS-C Fujifilm X-T3, for instance. Next to the A7R III, which has roughly the same resolution, the Z7's not nearly as good. To make matters worse, even when you do get a red box locked on to your subject, it seems like the autofocus can't keep up for burst shooting. The Z7 doesn't even shoot all that quickly, hitting 5.5 fps with continuous AF mode enabled, while Sony's A7R III autofocuses more accurately all the way up to 10 fps. And as mentioned, the buffer is so small that you can't shoot continuously for longer than a couple of seconds. Part of the problem with Nikon's autofocus seems to be processing speeds that are a tad slow. A DSLR like the D850 also has the advantage of a separate phase-detect sensor, which tends to help speed up autofocus for moving subjects. That said, when shooting in single-shot autofocus or continuous mode with slow-moving subjects, it works great. And compared to a DSLR, you will get slightly sharper focus, since the phase-detect and contrast-detect pixels are on precisely the same plane as the sensor. Just be aware that the Z7 is probably not ideal for action or wildlife photography. You'd expect that for a 45.7-megapixel camera, but it does have to be mentioned. With similar specs, Sony's A7R III has much better continuous autofocus and costs about the same. Despite those complaints, I liked shooting with the Nikon Z7 a lot. The classic layout meant I was more sure-handed using it right from the get-go and rarely messed up key settings when taking shots. The EVF was a joy to use, battery life excellent and I was pleased with the results once I got home. That's what counts, isn't it? As with Canon's EOS R, Nikon's new Z-Mount has major benefits where it counts -- in image quality. Nikon has yet to take full advantage, with a rather tepid, albeit economical, range of lenses so far. Most of the pictures I took for this review were shot with the 24-70 f/4 zoom and 35mm f/1.8 prime. It might have been smart of Nikon to release a better, faster prime to start with in order to get better sample photos for the initial reviews. With a 45.7-megapixel sensor that has no anti-aliasing (AA) filter, the Nikon Z7 can produce damn sharp images that are on par with its D850 DSLR sibling. Colors are accurate and pleasing for both video and photos. Shooting on a bright, contrasty day next to a canal and river, I had plenty of dynamic range and resolution to work with. The joy of having 45.7 megapixels is that if you're shooting against a bright background, you can still boost a dark subject's levels without excessive noise. At the same time, when I shot on the streets at night, the extra resolution let me apply noise reduction without making the image soft. I shot mostly with the neutral setting, which produces slightly desaturated photos but allows for more options later on in post-production. The Z7 produced excellent JPEG images, with accurate colors and just the right amount of sharpness. Without an AA filter, any occasional aliasing was never very noticeable. RAW image quality is on par, or even ahead of, any other full-frame camera, with impressive detail. Skin tones are excellent, and unlike other models (ahem, Sony), Nikon handles green tones well. The Z7's video is sharp, but maybe a bit too sharp. Nikon's 4K sharpening algorithm is pretty aggressive, but luckily you can disable it. In low-light conditions, the Z7 is as good as any high-resolution camera except for Sony's A7R III. It's close, though, and definitely up with Nikon's own D850, except in one area. Because of the phase-detect pixels on the sensor, you can sometimes see banding in low light, especially when you boost dark areas considerably in post. Otherwise, you have a lot of latitude to adjust RAW Z7 images in Lightroom, thanks to the great color science, low-light capability and high resolution. Video is a great story for the Z7 and Z6, and based on Nikon's recent comments, should get better over time. While Canon's rival EOS R camera has a huge 1.8x crop factor on 4K video, the Z7 can shoot 4K using the full sensor, albeit with some pixel binning. That doesn't seem to have much impact on sharpness, though it does add some moire and aliasing. If you want to avoid that, too, you can shoot with an APS-C crop factor (1.5x) and get a full sensor readout with no pixel binning. Either way, you'll still get significantly less cropping than you would with the EOS R. That means you can profit better from the large sensor, getting better low-light capability and shallower depth of field. Shooting speeds are limited to 30 fps in 4K, but you can shoot 1080p at 60 fps or 120 fps with a 1.5x crop, both with autofocus enabled. The EOS R, by contrast, limits 1080p shooting to 60 fps. To get 120 fps on Canon's camera, you have to drop down to a pitiful 720p, and autofocus doesn't work when you do. The Z7 can record 10-bit, N-Log video for better dynamic range, but only if you use the HDMI output. That will give professional video shooters more color depth and dynamic range to work with. Note, however, that Fujifilm's new X-T3 supports internal 10-bit recording and can also handle cinema 4K (4,096 x 2,160) rather than just Ultra HD 4K (3,840 x 2,160) like the Z7. Autofocus for video is, luckily, better than it is for photography, as you'd expect with a mirrorless camera. I found that the Z7 did an excellent job of locking on to subjects during video shooting, maybe even, surprisingly, besting Sony's A7R III. The Z7 is close to, but not quite at the level of, the Dual Pixel system of Canon's EOS R. This a nice and kind of surprising development, considering how weak Nikon has been on video in the past. Manual focus is trickier, however, and Nikon will need to address that if it truly wants to attract the pro market. It has focus peaking to help you see what's sharp, but the lenses themselves use a focus-by-wire electronic system that's tricky to use. On top of that, Nikon's focus rings work backwards from other cameras, and you can't reprogram them to work the "correct" way, like you can with Olympus cameras. The sharp electronic viewfinder helps, and as with photography, I found I preferred using it to the touchscreen. The VR stabilization system is also a huge bonus as I was able to use old-school, manual focus lenses like a Tokina 70-200 f/2.8 model and still get stabilized video. Videographers will also appreciate the microphone, headphone and HDMI ports. So who won the debut mirrorless full-frame camera shootout between Nikon and Canon? I'd have to give the initial trophy here to Nikon. Discounting the higher resolution and price, the Z7 is a better all-around camera. It's easier to shoot with, has excellent image quality and, most critically (and surprisingly) handles video better than the EOS R. On the flip side, the EOS R has better lenses to start with. The Z7 is a lot more expensive than the EOS R, but much of what I said applies to the Z6, which is actually the cheapest of the three. None of these cameras, however, can beat Sony's A7 III and A7R III just yet. This is just the start, though. Canon and Nikon both have a leg up on Sony with their RF and Z-Mounts. While Sony has better native lens support with 29 of its own models, Nikon and Canon offer excellent support for their existing F-Mount and EF lenses. In that sense, they're hitting the ground running with an advantage over Sony, which offered buyers very few lens options when the original A7 launched. I was chatting with a colleague who was debating chucking his Canon EF lens collection and 5D Mark III, and moving wholesale to Nikon with the Z7. I'm not sure I'd recommend that. Both cameras are pretty darn good for portrait, landscape, product and other types of photography. If you're going with action or wildlife photography, though, I'd probably go with a Sony A7 III or A9 models for the superior subject tracking, or even a DSLR like Nikon's D850. If you do a lot of video, then the Nikon Z7 is a better choice than the EOS R, and maybe even better than the A7 III, thanks to the 10-bit external output. If you don't need full-frame video, though, the Fujifilm X-T3 or Panasonic GH5/GH5s are better options. It might be best to wait. The cameras are a bit hard to get a hold of, for one thing, and we may see firmware updates that fix a few of the issues I've mentioned here. Most importantly, Panasonic is set to release its own full-frame camera early next year, so it'll be interesting to see how that stacks up. If you need to buy a high-resolution full-frame camera today, however, Nikon's Z7 is a great choice.